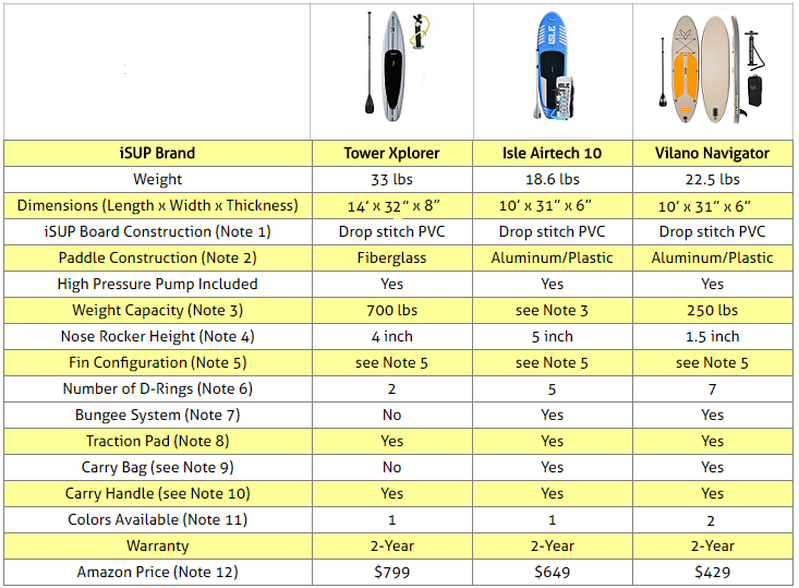 Compare Inflatable Stand Up Paddle Boards: Tower, Isle or Vilano? Stand up paddle boarding, also know as SUP boarding, is nowadays one of the fastest growing water sports due to the fact that just about any healthy person of any age and skill level can learn how to enjoy it in relatively short time. Indeed, it has become a great way to gather family and friends around an activity that is not only a lot of fun to do, but that also can be an excellent workout routine. SUP boarding can be done using either a hard or an inflatable paddle board. The latter is referred to often as iSUP boarding. They are easier to carry and store: When not inflated, most commercial iSUP boards can be rolled up into a cylinder shape not larger than 1 foot in diameter and around 32 inches wide. This means that they are very easy to carry in a bag or backpack, and they are easily stored at home, in your car or boat. No need of roof racks as in the case of hard boards. Some are also equipped with a strap that allows the rolled up cylinder to be tied to a bicycle. They are gentler on the feet: While iSUP boards are very rigid and solid once inflated, the air that is inside the paddle board cushions your feet a lot more than the surface of a hard board would, no matter how good the deck pad on the board might be. They display better resistance to damage: Hard paddle boards are known to sustain cracks and dents. Inflatable paddle boards have much better resistance to damage and you will practically see no more cracks or or nicks on your paddle board. They are softer: Though they are very rigid when inflated, they are softer than any hard paddle board to the touch, and even in wavy conditions, if the board hits you, you will not be hurt or get knocked out. Though they are softer, riding a rigid inflatable SUP will make you feel like you’re on a hard board without compromising security, stability or performance. They are easy to look after: Maintenance is simple, just rinse after use and use mild soap and water when it’s time for an extra cleanup. This article will compare Tower Xplorer, Isle Airtech 10 and Vilano Navigator inflatable stand up paddle boards. These were not just very popular among Amazon customers at the time this article was written, but they had also received excellent reviews from most Amazon buyers (an average of at least 4 stars each, out of 5 stars!). All three paddle boards considered here were built using drop-stitch PVC construction which involves linking the top and bottom of the inner sides of the board with vertical connecting fibers that are maintained in the desired shape even under high internal pressure. The result is a paddle board made of a "fabric" that when inflated is very tear-resistant, that can resist to quite heavy loads while maintaining stable dimensions, yet collapsible to a small easily portable size when deflated. Modern SUP boards with a drop-stitch thus design allow an internal inflation pressure of 10 to 25 psi. For The ISLE and Vilano iSUP boards considered here, the paddle poles are made of aluminum and the paddle blades are made of plastic. The Tower USUP board paddle is made of fiberglass with an ABS plastic blade. There is rubber edging built around ABS plastic blade." The tower paddle weighs 34 ounces, the ISLE paddle weighs 41 ounces, and the Vilano paddle weighs 32 ounces. The manufacturer specification for the Isle Airtech 10' paddle board is maximum 190 lbs for beginners. The nose rocker (known also as the flip) is the curve between the front tip and the middle or flattest portion of the board. Tower Xplorer 14' and Vilano Navigator 10' paddle boards come with one removable fin. Isle Airtech 10' paddle board come with a 2-plus-1 fin setup. The side fins are always attached to the board while the center fin is removable. Tower has one front towing D-ring and one rear surf leash D-ring. Isle has one rear surf leash D-ring and an additional 4 D-rings on the body used for the bungee system. Vilano has one front towing D-ring and 6 additional D-rings on the body, four of them used for the bungee system. There is no rear surf leash D-ring. Note that the carry handles on these boards can also be used to attach gear if required. The bungee system allows you to easily attach extras like sunglasses, camera, snacks and the Coast Guard-mandated life vest now required on most waterways. Even though the Tower paddle board has only two D-rings, additional D-rings can be bought and glued to the deck with vinyl glue so that you can run your own bungee. Paddle boards use traction pads as opposed to the wax used on surfboards for friction, so the rider can keep their balance and grip on the board while paddling. All three paddle boards considered here have a diamond groove traction pad. Even though the Tower Xplorer paddle board does not come with a carry bag, it is equipped with a strap that can be used to firmly tie the deflated and rolled up board so that it can be easily carried. Alternately, bags/backpacks that can be purchased separately are available on Amazon. Tower and Vilano paddle boards considered here have one single carry handle in the middle of the traction pad. 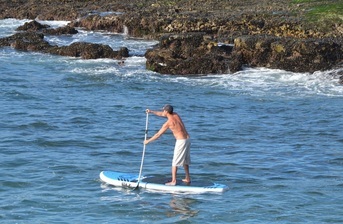 ISLE paddle board has two carry handles, one on the middle deck and one on the nose. When you view the Vilano Navigator in the Amazon products section below, you will be offered a color choice of either blue-grey or grey-orange. The prices shown are Amazon prices that usually include a large discount to the list price of sold products. These prices were in effect at the time this article was written and may have changed. For exact price information, please refer to the Amazon section below. So which of the three iSUP boards to buy? All three inflatable paddle boards considered here are excellent products as confirmed by Amazon customer reviews and the excellent ratings the reviewers gave them (an average of at least 4.5 stars each, out of 5 stars, at the time this article was written!). The important point to note is that, when inflated, these boards are all 6 inches thick and extremely rigid drop-stitch PVC boards which ride high on the water with no sagging in the middle of the board, as opposed to most other inflatable boards on the market which are only 4 inches thick, sag in the middle and ride low in the water, causing you to stand in a puddle of cold water. These boards are so hard when inflated and have such minimal flex that you can hardly tell they were inflated. You can bump them off rocks and not worry about damage! Tower Xplorer is larger than the other two boards considered here, and it has a higher load capacity (700 lbs). So, for weights over 250 lbs, you might want to consider the Tower Xplorer. It is also very stable and paddles quite well. The over-sized removable center fin helps it glide straight and track smoothly. If you need to take along along gear that needs to be attached to the paddle board, or you want a carry bag that is included in the purchase, you may want to consider the Isle Airtech 10' or the Vilano Navigator which are both equipped with a bungee system and more D-rings than the Tower Xplorer, and both come with a carry bag. 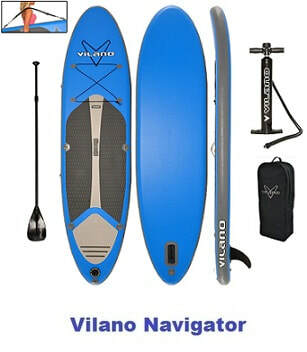 Finally, if you don't want to pay the slightly higher prices of a Tower or Isle board, and you don't need to carry loads that are over 300 lbs, you should could consider the Vilano Navigator which will provide you all the pleasures of stand up paddle boarding while saving you some money. Please click the SUP board of your choice below for price information or to purchase.